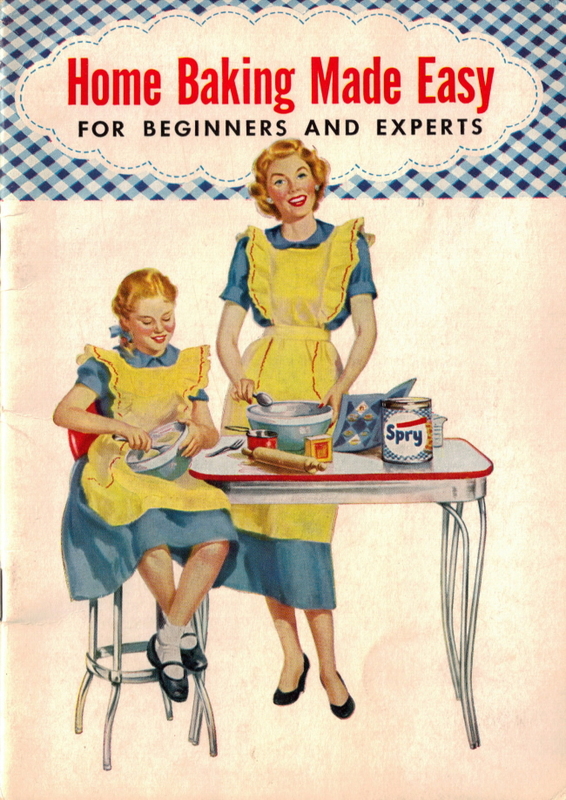 Here is page 15 of the vintage cookbook: Home Baking Made Easy that was published in 1953 by Lever Brothers Company. 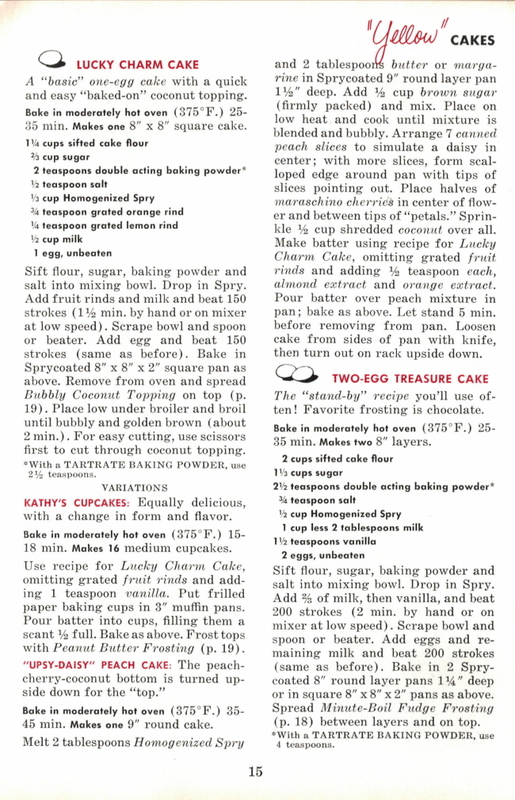 A “basic” one-egg cake with a quick and easy “baked-on” coconut topping. Bake in moderately hot oven (375° F.) 25-35 min. Makes one 8″ x8″ square cake. Sift flour, sugar, baking powder and salt into mixing bowl. Drop in Spry. Add fruit rinds and milk and beat 150 strokes (1 1/2 min. by hand or on mixer at low speed). Scrape bowl and spoon or beater. Add egg and beat 150 strokes (same as before). Bake in Sprycoated 8″ x 8″ x 2″ square pan as above. 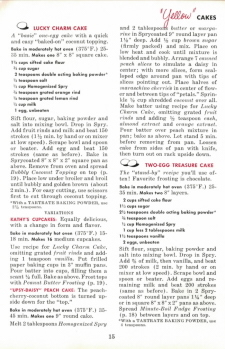 Remove from oven and spread Bubbly Coconut Topping on top (p. 19). Place low under broiler and broil until bubbly and golden brown (about 2 min.). For easy cutting, use scissors first to cut through coconut topping. *With a TARTRATE BAKING POWDER, use 2 1/2 teaspoons. KATHY’S CUPCAKES: Equally delicious, with a change in form and flavor. Bake in moderately hot oven (375° F.) 15-18 min. Makes 16 medium cupcakes. Use recipe for Lucky Charm Cake, omitting grated fruit rinds and adding 1 teaspoon vanilla. Put frilled paper baking cups in 3″ muffin pans. Pour batter into cups, filling them a scant 1/2 full. Bake as above. Frost tops with Peanut Butter Frosting (p. 19). Bake in moderately hot oven (375° F.) 35-45 min. Makes one 9″ round cake. Melt 2 tablespoons Homogenized Spry and 2 tablespoons butter or margarine in Sprycoated 9″ round layer pan 1 1/2″ deep. Add 1/2 cup brown sugar (firmly packed) and mix. Place on low heat and cook until mixture is blended and bubbly. Arrange 7 canned peach slices to simulate a daisy in center; with more slices, form scalloped edge around pan with tips of slices pointing out. Place halves of maraschino cherries in center of flower and between tips of “petals.” Sprinkle 1/2 cup shredded coconut over all. Make batter using recipe for Lucky Charm Cake, omitting grated fruit rinds and adding 1/2 teaspoon each, almond extract and orange extract. Pour batter over peach mixture in pan; bake as above. Let stand 5 min. before removing from pan. Loosen cake from sides of pan with knife, then turn out on rack upside down. The “stand-by” recipe you’ll use often! Favorite frosting is chocolate. Bake in moderately hot oven (375° F.) 25-35 min. Makes two 8″ layers. Sift flour, sugar, baking powder and salt into mixing bowl. Drop in Spry. Add 2/3 of milk, then vanilla, and beat 200 strokes (2 min. by hand or on mixer at low speed). Scrape bowl and spoon or beater. Add eggs and remaining milk and beat 200 strokes (same as before). Bake in 2 Spry-coated 8″ round layer pans 1 1/4″ deep or in square 8″ x 8″ x 2″ pans as above. Spread Minute-Boil Fudge Frosting (p. 18) between layers and on top. *With a TARTRATE BAKING POWDER, use 4 teaspoons.